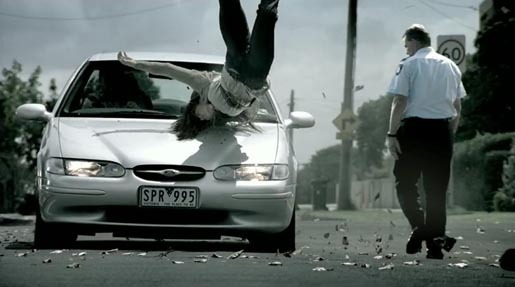 TAC (Transport Accident Commission) in Victoria, Australia, launched a visual effects-laden television commercial in March 2006, demonstrating in reverse slow motion the dynamics of an accident in which a woman is knocked over by a speeding car. Police investigator Sergeant Peter Bellion walks the viewer through the accident. “Our job is to reconstruct serious crashes to get evidence that may be used in court. This young woman landed here with serious head injuries following a huge force that threw her over six metres. And the impact here. We can work out that she was hit at 32 kilometres per hour by analysing the car, these tyre marks. So he started braking here. He first saw her when he was traveling at 65. Well let’s change one small thing. Now he’s doing 60 when he sees her. This time he hit her at only five kilometres per hour. She’d just have a bruised leg and we’d never have been called to this incident.” The super: “Wipe Off 5”. 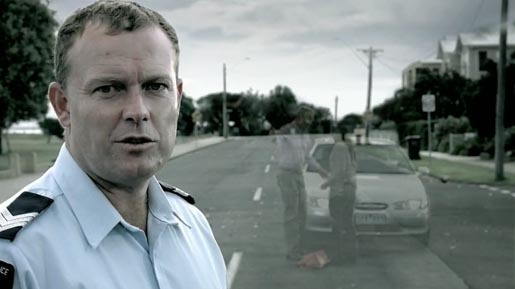 Adelaide’s Centre for Automotive Safety Research and the Victoria Police Major Collision Investigation Unit both contributed expert opinion to the campaign. TAC Reconstruction was created at Grey Worldwide, Melbourne, by creative director/art director/copywriter Nigel Dawson, with agency producer Sandi Gracin. Filming was directed by Bruce Hunt via @Radical Media, Sydney, with director of photography Simon Duggan and producer Tony Tvrdeich. Editor Drew Thompson, at Guillotine, Sydney, was shortlisted at the Clio Awards 2007. Sound was designed at Song Zu, Sydney, by Simon Kane. Music was composed by Ramesh Sathiah at Song Zu. Visual effects and animation were developed at Fin Design, Sydney, by animator Stuart White, visual effects producer Emma Daines, visual effects editor Richard Lambert.